Considering Earth is about 70 percent water, Pierre Wallinder figures it's better to learn to sail than to drive. That might be the most practical distillation of his work, an adage he offered while piloting a pontoon through Lake Erie's waves Monday morning. The kids and teens sailing around him seemed more concerned with smiles as they set out on one of the Sail Buffalo Sailing School's trips. 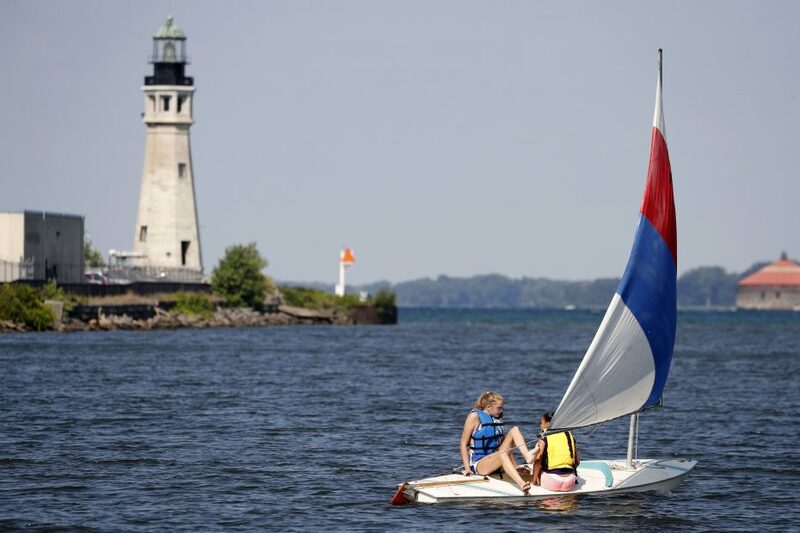 The dinghy-sailing crews of two were all members of the school's day camp, which is based at the end of Fuhrmann Boulevard in the Outer Harbor and runs for nine weeks during the summer. "If you're into nature and spending every single second of the day in the water and living summer to its fullest," said camper Kiera Quinlivan, "this is definitely the camp for you." Wallinder, the school's director and head instructor, described the camp as true to his roots on the west coast of Sweden, an "always windy and always wavy" place filled with fishing villages where he learned to sail as a boy. It's decidedly not an upper class yacht club. Instead, the school offers scholarships for promising kids and teaches them hands-on with cables, rudders and the like. "Being on the water fosters independence, self-reliance," Wallinder said. Campers learn to adapt to the day's conditions. They learn for the craft itself, rather than to compete. "The wind is a perfect teacher," Wallinder said, explaining that sailors can figure out which way to pull their lines or lean their bodies by feeling the wind's resistance. "It will teach you." After a class session at 9 a.m. each day, the campers head out to the shore of the Buffalo River, where a fleet of small dinghies and medium-sized keelboats are docked. Before the dock is the school's office, a wooden building modeled after a houseboat. You'll also find, side by side, the two assets the school hopes to rehab with future funds: a nationally registered historic sloop named the Clara Brown, designed in the 1950s by renowned naval architect John G. Alden, and the school's floating classroom, a canopied platform buoyed by about 6,400 recycled plastic bottles. Wallinder called the Clara Brown the school's flagship, but said it needs to be restored. And the classroom, built in 2011, needs shutters installed. The projects will together cost $60,000. The campers usually only practice with winds between 10 and 15 mph. On Monday's almost-cloudless sunny morning, the wind was blowing at about 7 mph, an ideal speed. Along with the more-advanced sailors, piloting ships in teams of two, counselors had taken a squealing group of younger rookies out on a keelboat to get a feel for the water. Sitting with her partner, Kasandra Castro smiled as their dinghy skipped along the waves. The 14-year-old from Lackawanna is a counselor-in-training attending the camp on a full scholarship. Wallinder said she earned it because of her leadership potential. Ever since a day trip to the camp this year, she has been hooked on sailing. "I love it," she said during lunch inside the camp's center pavilion, a blue-painted building where classes and other activities are held. "It's peaceful." Sailing is also a way for her to connect with memories of her childhood in Puerto Rico, where as a child she rode on boats. "They might get attached to it, that's what happened to me," she said of people considering the sport. "It's making your day better." She said her scholarship is a sign she can reach bigger and better goals later in life. Quinlivan, also 14, brought up the peaceful experience of sailing, too. "It allows you to meditate and think," the Buffalo teen said. "It's just you and the water — you have this connection." This is her second year coming to the camp, and she's planning to return for a third. The sailing school has been open for over a decade but only found its home off the Buffalo River four years ago. It is open from May 15 to Oct. 15 each year and offers sailing certificates on weekends. "I wanted my children to have a meaningful activity in Buffalo," Wallinder said, explaining why he helped found the school after moving here in 1999. His goal grew to helping anyone around the area. Last year, he said, the camp drew around 150 kids, on top of about 250 other visitors who came on day trips. The secret to it all, he explained as his pontoon zipped across Lake Erie, is simple: "Kids have fun with other kids." 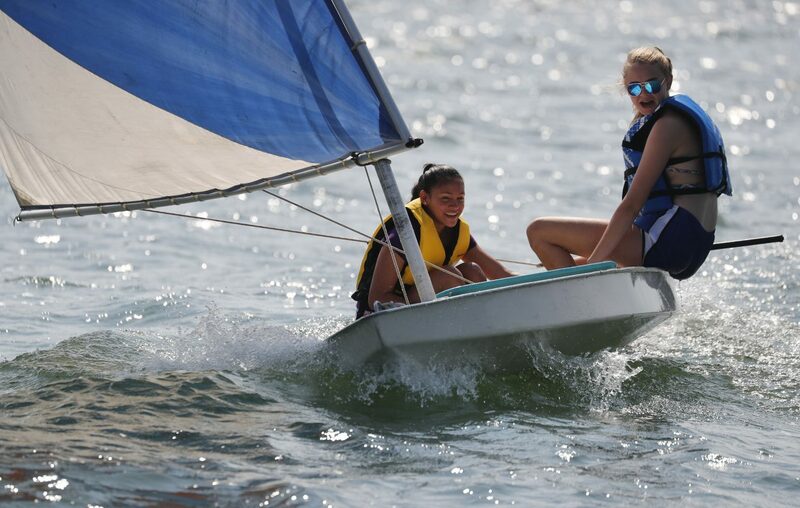 For details on registering for the camp, visit the Sail Buffalo Sailing School website or call 716-432-6589.